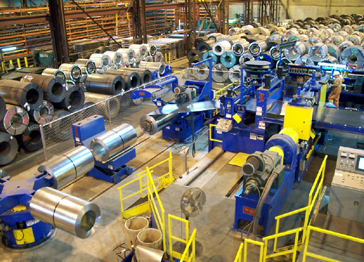 Vancouver, BC - Wilkinson Steel & Metals, a full line ferrous and non-ferrous metals distributor and coil processor with ten (10) locations throughout Western Canada, has installed a high-performance Braner/Loopco Double-Loop Turret Head™ Slitting and Automatic Slit Coil Packaging Line in its flagship Vancouver, BC facility. 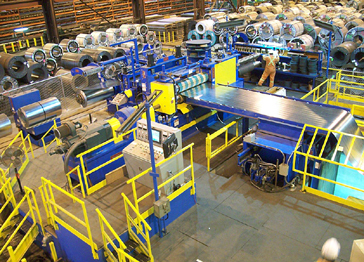 Equipped with nearly 600 total horsepower, Wilkinson Steel's new high-performance slitting line has the ability to process 60,000# coated and bare carbon steel, aluminum alloy, and stainless coils in widths to 60" at slitting speeds to 1,000 FPM. Coil gauge capacity is from .012" minimum through .187" maximum, with coil mechanical properties ranging to 80,000 PSI yield strength. Surface-critical coil can be efficiently processed in a "Double-Loop" slitting mode wherein the DC motor driven loop-control Uncoiler drives the coil to form a free-loop ahead of the slitter, allowing for high-quality tension-free thin gauge slitting. Tension-free slitting eliminates slitter tooling induced strip surface scuffing, and generates tighter slit width tolerances. 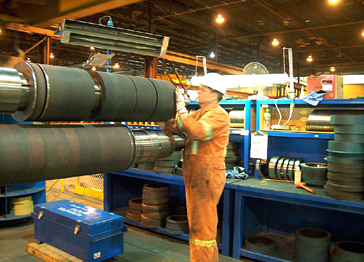 Single-Loop and two (2) Tight-Line operating modes are employed for slitting medium and heavy-gauge coil. 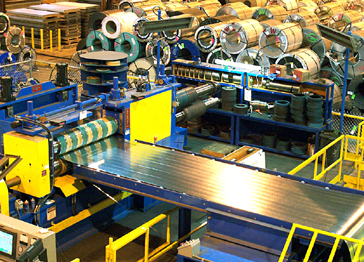 The high pass line system configuration allows Wilkinson to process coils without reverse bending against the natural coil set, which results in quick and easy coil threading, elimination of reverse-bend coil-breaks, and elimination of strip surface damage from deflector roll scuffing. The configuration also conserves floor space and provides for superb coil tracking at both entry and exit ends, which results in tight straight wall slit coils. A non-contact hydraulic servo Edge Guide is employed to automatically guide and align the coil edge into the Slitter at all line speeds. Pushbutton adjustable Roller Guides with electronic position readouts make coil threading and tail-out fast and effortless. A Hydraulic Guillotine Shear crops coil heads and tails and collects the scrap in a Scrap Car for quick disposal. Wilkinson's "Pushbutton Tooling Lock-Up" quick-change Turret Head Slitter produces precise width tolerance slit strips with minimum burr throughout the entire range of gauges and mechanical properties. A 200 HP Slitter drive gives Wilkinson the ability to process up to 10-cuts in .187" in one-pass. Two (2) quick-change heads equipped with a pushbutton tooling lock-up system that eliminates threaded lock nuts, allows Wilkinson to achieve a highly efficient just-in-time production schedule and delivery program, and respond quickly to urgent customer requirements. Wilkinson Steel's Turret Head™ Slitter is equipped with two (2) slitter heads supported in massive precision machined solid steel bearing housings. The rotatable Turret is supported on a precision anti-friction ring bearing, which assures precise arbor alignment and accomplishes effortless head changes in one-minute. The slitter heads at the "set-up" station are open and accessible with no housings, bases, or structures to obstruct tooling removal and installation. Free and clear access and quick-change ability gives Turret Head™ Slitter users the ability to make more set-ups and head changes per shift than with any other multi-head slitter or tooling transfer design. Turret Head™ Slitters are equipped with multiple "integral" slitter heads that do not detach and uncouple in order to change heads. The one-piece integral design makes Turret Head™ Slitters more rigid, more precise, and more reliable than any other slitter or tooling transfer design.